Are your policies customer friendly? Two small businesses have hit the national news this week for the wrong reasons. A hotel in Blackpool charged customers £100 for leaving a negative review on Trip Advisor and a cafe in Gomshall, Surrey put a sign up which nursing mothers interpreted as an instruction to feed their babies in the toilet. The hotel has now changed its policy which is just as well as what they were doing was almost certainly illegal. However this story has brought far more negative publicity than the review on Trip Advisor ever would. The story has been widely shared on social media and the hotel owners have been forced to admit that there is much scope for improvement. They have not managed this story well and it will cost them business if not the business. The cafe has managed the story rather better and has let it be known that they are working with mothers’ groups to try to find a solution that suits everyone. However wouldn’t it have been better if they had done that in the beginning? Is this going to be customer friendly? 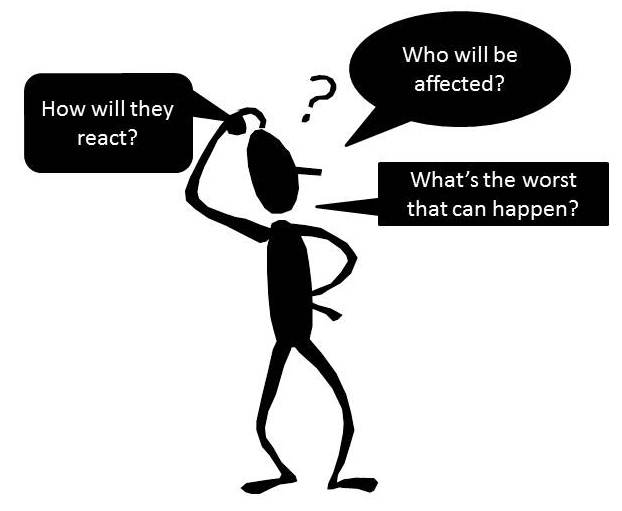 There are times when we develop a policy as a reaction to a situation or an event. Sometimes we design a policy to suit one group of customers and in the process inadvertently alienate another group; so how do we avoid this? Look at every policy from the customer’s point of view, who will be affected? How will this affect them? Seek advice. Consult Trading Standards to ensure your policy is legal. Discuss with groups representing different types of customer e.g. a mothers’ group or a disability association. Have other people look at the wording of your signs or policies. We can all get too close to our own issues or ideas to see all the pitfalls. Take your time. Policies developed on the hoof often come back to bite us! I’ve written about this before but it’s essential that we manage any negative publicity before it impacts our business. This includes responding to bad reviews left by customers. We need to hold our hands up when we’ve got things wrong and tell anyone who wants to hear what we’re doing to put things right. We need to apologise when a customer is disappointed but we don’t have to admit liability if we think they are being unreasonable or are not genuine. Some people will leave negative reviews in the hope of getting a concession from you. Some review sites don’t even check that the person leaving the review is a genuine customer! Don’t be tempted to get into long explanations or justifications and never, ever vent your anger on a review site. Be open to negative reviews, they could be telling you something you need to hear. Do you need to make changes? If so tell the reviewer what you’re doing and invite them to give you another try once the changes have been made. An unhappy customer whose problem has been solved usually turns into a business’ best advocate and when they do share the positive publicity as widely as you can. This entry was posted in Customer service, Marketing, Small business advice and tagged customer expectations, customer feedback, Public relations by glendashawley. Bookmark the permalink.